This week, thousands of birds and fish were found dead in Arkansas, prompting fears that the rapture is upon us. Experts say we're all being irrational, but how to they explain the huge numbers of dead animals turning up worldwide? Yesterday 500 red-winged blackbirds and starlings were found along a quarter-mile stretch of Louisiana highway. Here's a disturbing description, courtesy of The Advocate: "some [birds] were lying face down, clumped in groups, while others were face up with their wings outstretched and rigid legs pointing upward." Yikes. We may not know what killed the birds for several weeks (if we're still around then), but experts are suggesting disease, starvation, or cold fronts could be to blame. As for the original birds in Arkansas, "Necropsies performed Monday on the birds in Arkansas showed the birds suffered internal injuries that formed blood clots leading to their deaths." Ah, that clears things up! Birds aren't the only critters incurring the wrath of some higher power. 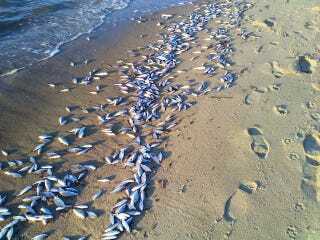 An estimated 2 million fish have died in the Chesapeake Bay, according to The Baltimore Sun. A spokeswoman for the Maryland Department of the Environment reports there's nothing wrong with the water quality in the Bay, and biologists believe "cold-water stress" killed off the fish. Across the Atlantic, 40,000 dead Velvet swimming crabs — also known as DEVIL crabs — have washed up near Kent. Environmental experts tell the Daily Mail that cold temperatures are to blame for the mass of dead sea life, which also includes smaller numbers of whelks, sponges and anemones. Britain is having its coldest winter in 120 years, and icy temperatures killed off sea life last year too, but we're still not buying it. Sure, these explanations sound reasonable, but what about the three dead cranes found in Georgia that somehow made the national news? And just today I spotted a dead pigeon on the streets of New York! Animals are dropping right and left! Scientists may say animals die all the time of totally natural causes, but now nothing will convince us these mysterious deaths are anything less than a sign of the apocalypse.